When it comes to Valentine’s Day, is there a thing as too much red? Too much glam? Too much fancy? Right after Christmas I was swiveling around the mall and found this jacket at Niemans on sale. And while I knew it was over the top, I also knew it was SO ME. I fell in love with what a statement it makes (hello sleeves!! ), and figured it would be the perfect piece to bring out at V-Day and of course Christmas too. Hope you guys had a great weekend! It was almost in the 80’s here, so we spent as much time as we could outside. It’s days like these when I remember why everyone wants to move to CA, and why it’s so crowded and expensive! I am loving your outfit…this is fire….the jacket is all shades of cute. These sleeves are everything! And so you, Shauna! What a great after Christmas find. I hope you guys had a great weekend. I’m so jealous of your warm weather! We are going to be in the single digits here this week — send your warm weather to the east coast! Happy Monday! What an awesome jacket!! You’re right, it’s absolutely perfect on you! Oh what a beaut blazer! Obsessed! SO cute! Love that color on you! OMG I love this look babe! Such a great find; the statement sleeves are so beautiful!! Yesss…so fabulous and absolutely YOU! I love the jacquard detail and you better be wearing this on V-Day! Fierce and fancy in florals. This jacket is amazing, I mean those sleeves are fabulous and so perfect for Valentines Day. Or any day in my book! Love it! I love this outfit so much! Such a fun jacket! No, never too much red or fancy!! This is amazing!! So ready for Valentine’s Day! That jacket is beautiful! I love the statement sleeves. How fun! Cute bag too. I am a fan of mini bags so I am swooning head over heels over here. 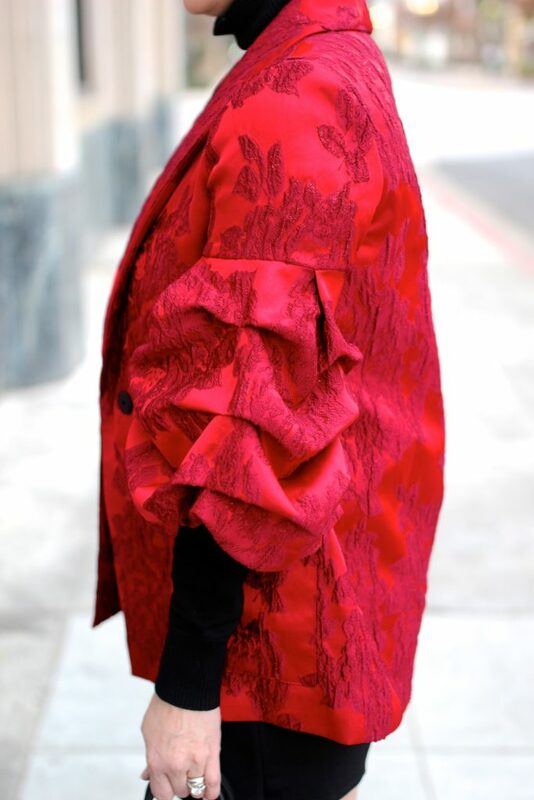 That red jacquard coat is a stunner and so unique with the fun sleeves, the collar and the belt. No wonder it is sold out. Love it for VDay and in this outfit where you faked a little black dress. Well done! Oh and it is 8 degrees in here today. Wish there was a 0 behind it lol. That jacket is a show stopper! Love the sleeves! You look so chic! You totally can pull it off! I love the sleeves and how dramatic it is! This jacket is adorable, the sleeves are fun and elegant. The sleeves on this jacket are to die for, sista! Red will always be the perfect color for Valentine’s Day! I love the print on your jacket it makes it look even more fabulous! Wowee! LOVE this look on you!The jacket is gorgeous, love the sleeves, its no wonder it is sold out! I love the mix of black and your hair looks adorable up! This is such a fab look on you dear! Love it, so fancy and sassy! Such an amazing look! You look so stunning!